Mark Haines musical career spans forty years and counting! Over that time he has performed in bands, in stage productions and as a solo artist. He has played concerts, festivals, conventions, pubs and churches all across Canada and the United States. His touring has taken him to Britain, Sweden and as far afield as Taiwan. Mark is a multi-instrumentalist and enjoys a roots approach to all his music. He is a consummate musician, a gifted entertainer and a successful educator. His repertoire, sense of humour and personable style make him popular where ever he plays. He has commercially released six recordings and has appeared as a guest on many others. For over thirty years he has performed with friend and colleague Tom Leighton, see Haines-Leighton.com. Since 2013 he has teamed up with Patrick Ledwell for The Island Summer Review and together performed consistently sold out shows at Harmony House Theatre in Hunter River, PEI. Mark performances and recordings draw from a large repertoire of original and North American roots based music. During his lengthy career he has explored many musical idioms, well versing him in folk, Celtic, blues, jug band, blue grass, swing, gospel and and rock ’n roll. His original songs have been awarded and recognized in popular publications. 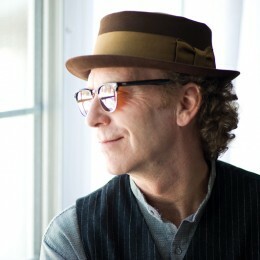 Mark’s song “Hand To Hand” won Song of the Year at The Prince Edward Island Music Awards and was published in Canada’s folk-roots magazine, Penguin Eggs. His song “I’m On My Way” was recently published in the Rise Again Song Book and his song “The Red Haired Girl” included in The Prince Edward Island Folk Song Book. Mark’s theatre career has taken him from rural community presentations to Murvish productions in Toronto. He has participated every aspect of musical theatre. For four seasons, he performed in the pit orchestra for the Prince Edward Island production of the musical Anne & Gilbert and recorded with the original cast on their East Coast Music Award winning soundtrack. He has had lead acting roles on stages that have included The Harbourfront Theatre, Summerside, PEI; The Royal Alexandra Theatre, Toronto, Ontario; and he has written and performed shows for The Festival Of Small Halls, PEI. Mark enjoys a full musical schedule and brings a life time of skills and passion to every concert, recording and show he performs.